A heat pump is a good solution for any Nashville, TN home’s heating needs. However, before you can enjoy the low cost and reliability of such a system, you need to have it installed. To make sure that installation is completed properly, it is important that you hire a professional with many years of experience working on such systems. 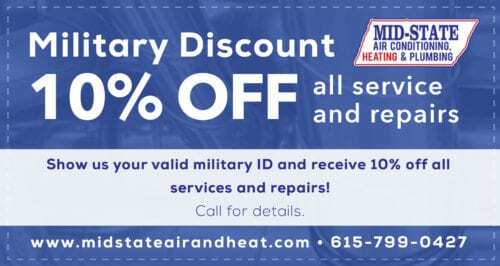 In the Middle Tennessee area, that company is Mid–State Air Conditioning, Heating & Plumbing. If you decide a heat pump is a good match for your home, give us a call today in Nashville, TN to learn more about the installation process. The first step we will take is to visit your home and perform a thorough inspection of your existing heating system and the needs of your home. 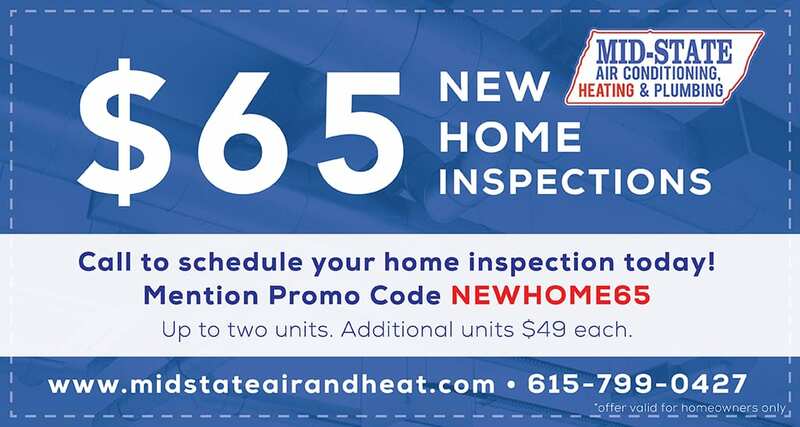 During this inspection we will measure things such as the square footage that will be heated and cooled in your home, the insulation already installed in your home, and any existing components that will remain such as your air handler or your ductwork. Using the measurements we take during this inspection, we will design the perfect heat pump system to match the specific heating and cooling needs of your home. We’ll also discuss with you what level of efficiency you’d like to have. Remember that high–efficiency systems, while they may cost more to install, generally save a significant amount of money over their lifespan. To learn more about what type of heat pump will best fit your home, give us a call today and ask to talk to one of our heat pump installation experts. There are many benefits to replacing the existing heat pump in your home. For example, if your existing heat pump requires frequent repair visits, a new model will alleviate a lot of expenses. 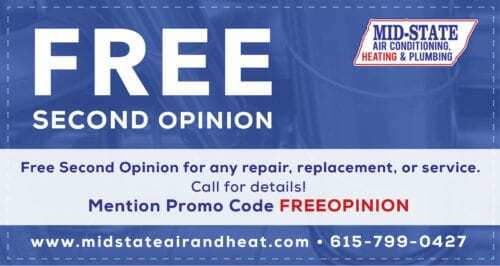 Instead of having someone visit your home two or three times a year to repair your heat pump, you can have one or two preventive maintenance visits performed. These are not only less expensive, but they ensure the system continues to operate at peak efficiency for many years to come. Additionally, newer heat pumps are generally much more efficient than older models. If your heat pump is more than 10 years old, a replacement will almost surely reduce the cost of operating such a system. To learn more about exactly how much money you will save by upgrading your existing heat pump to a modern high–efficiency model, give us a call today and ask to talk to one of our heat pump replacement specialists. 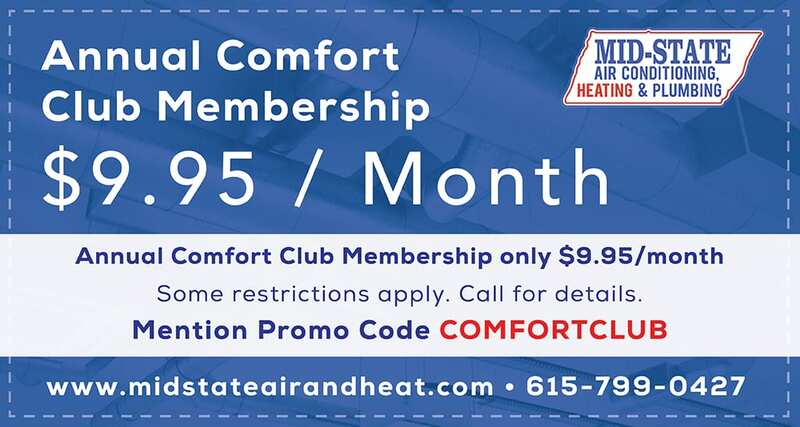 Whether you want to learn more about switching to heat pump technology for your heating and cooling needs or are ready to have your existing heat pump replaced with a newer, high efficiency model, now is the time to call the experts in Nashville, TN at Mid–State Air Conditioning, Heating & Plumbing. Contact us today to learn more about all of our heat pump installation and replacement services.